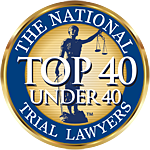 New Jersey Personal Injury Lawyers, Attorneys – Aggressively pursuing and maximizing compensation for accident victims. We know the tangible costs of your injuries (medical expenses, lost wages, temporary and future care) and understand the intangible costs (emotional and physical pain and suffering). No matter the injury, Robert will offer a complimentary consultation to suggest the best way to pursue your legal rights to meet your goals. At The Law Offices of Robert F. Black, Jr., we will aggressively pursue the maximum compensation for your injuries. We understand and seek to minimize the impact of your injuries, medical expenses, lost wages, and cost of future care, as well as your emotional and physical pain and suffering. If you have been injured as a result of someone else’s negligence, healing must be your primary goal. While you focus on your physical and emotional well-being, you need a New Jersey personal injury lawyer who is committed to ensuring your financial security. At The Law Offices of Robert F. Black, Jr.,, we will negotiate and, when necessary, litigate to provide you the compensation you deserve. Time is of the essence, so contact us immediately for a free consultation. Atlantic, Bergen, Burlington, Camden, Cape May, Cumberland, Essex, Gloucester, Hudson, Middlesex, Monmouth, Morris, Ocean, Passaic, Somerset and Union.